When I think of Christmas foods, I think sweets! 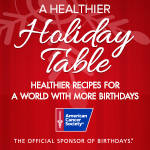 Not all of the sweets at the dessert table have to be bad for you, so this year I’m teaming up with the American Cancer Society on their series A Healthier Holiday Table. 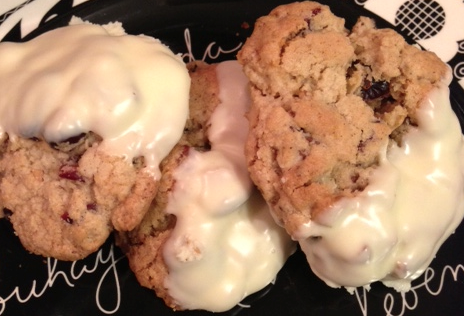 Ever since my husband found out that he had a gluten allergy, we’ve been trying to adapt some of our favorite recipes, so that’s what we did for my favorite White-Chocolate Dipped Oatmeal-Cranberry Cookies which we originally found in a past Southern Living Holiday Cookbook. Maintaining a healthy weight can reduce your risk of many types of cancer. The American Cancer Society recommends eating at least 2½ cups of vegetables and fruits each day. 1. Beat butter at medium speed with an electric mixer until creamy; gradually add sugars, beating well. Add egg and vanilla, beating until blended. 2. Combine flour and next 3 ingredients; gradually add to butter mixture, beating until blended. Stir in cranberries, pecans and oats. 3. Bake at 375° for 9 to 11 minutes or until lightly browned. Cool on baking sheets 2 minutes. Transfer to wire racks to cool completely. 4. Microwave white chocolate and shortening in a medium-size microwave-safe bowl on HIGH 1 minute or until chocolate melts, stirring once. Dip half of each cookie into melted chocolate, letting excess drip back into bowl. Place dipped cookies on wax paper; let stand until firm. I make this in bulk and keep in a container in the pantry. When all purpose flour is called for in a recipe just replace it with the same measurement of this.